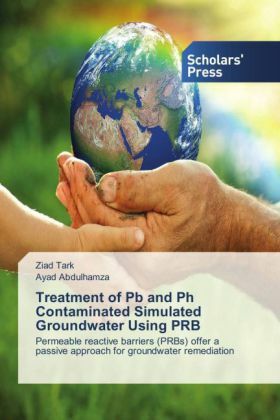 The present study investigates the possibility of using granular dead biomass in the permeable reactive barrier (PRB) technology. This technology is one of the promising innovative in situ groundwater remediation methods used in this study for the removal of lead (Pb+2) and phenol (Ph) from a contaminated shallow aquifer.In the batch tests, the influence of several operating parameters including contact time, initial pH, sorbent dose, initial contaminant concentration, and agitation speed were investigated.The sorption data for single system of Pb+2 or Ph obtained by batch experiments, have been subjected to six isotherm models,on the other hand, sorption isotherm data for the binary system on the granular dead biomass and sandy soil have been subjected to three isotherm models.Numerical model was formulated by explicit finite difference method to simulate the one dimensional transport of Pb+2 or Ph spatially and temporally under equilibrium condition. Additionally, computer solutions (COMSOL) Multiphysics 3.5a package based on finite element method was used for determining the distribution of these contaminants in one and two dimension under equilibrium condition.